one of these is missing, no crime will occur. crime, thereby reducing the likelihood that crime will occur. You don’t necessarily need physical strength, agility or speed. You do need to be alert, cautious and self-confident. 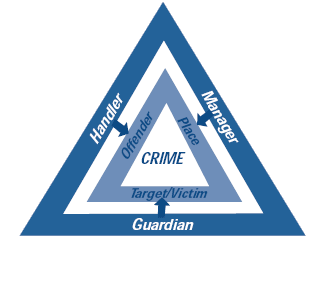 How criminals operate – they look for the easiest opportunities. How to foil them – you can spot opportunities before they do, and remove them. Trust your instincts. If you suspect something is wrong or a situation seems dangerous, you may be right. Report suspicious activity to the police. Avoid dangerous situations. Don’t invite trouble. Dress appropriately. Avoid wearing clothing and jewelry that is flashy and that may draw unwanted attention. Walk with someone. If you must walk alone, walk confidently. Walk near people. Avoid isolated parking lots, roads, etc. Protect your valuables. Carry only what you need with you. Carry your wallet in a front inside pocket instead of rear pocket or purse. If you carry a purse, hold it close to your body. Avoid purses with shoulder straps. Do not leave purses unattended in shopping markets. Act suspicious, turn and look at the person. This gives you time to plan your strategy and also lets the person know that you won’t be taken by surprise. Change directions. If someone is following on foot, cross the street and vary your pace. If the person is in a car, turn and walk in the opposite direction. Go into a store or other public place. Evaluate the situation. Are there sources of help? What is the attackers’ state of mind? Make a decision. Be realistic about your ability to protect yourself. Screaming, hitting or biting may give you a chance to escape but could expose you to greater harm. Give up our valuables. Your personal safety is more important than valuables which can be replaced. Follow your instincts. Attract as much attention as possible. Scream, run, bite, etc. Most attackers will flee if victims put up a fight. Whatever plan you choose, act immediately. Remember that your goal is escape and survival. Request identification from anyone claiming to be a repairman. Always lock your vehicle doors – 80% of stolen vehicles are unlocked. Roll vehicle windows up tight. Don’t leave any valuables in vehicle. Don’t hide spare keys – they can be found. Use a club and/or alarm system. Stop delivery of newspapers, mail, etc. Leave a “lived-in” look by leaving lights on timers, shades up, etc. Don’t discuss your trip in public before you go. Have close neighbors keep an eye on your residence. Carry traveler’s checks and credit cards instead of cash. Leave your valuables in the hotel/motel safe. Do business only with those you know and trust. Understand the offer – be sure to know who and where the company is and how to reach it, what is being sold, the total price, the delivery date, the return and cancellation policy, and the terms of any guarantee. Check the company’s track record. Ask your state or local consumer protection agency or better business bureau if the company is licensed or registered. Be careful who you give your financial or personal information to. Take your time to decide. High pressure sales tactics are often danger signs of fraud. If you have lost money to a fraudulent telemarketer, beware of bogus recovery services that offer to get it back for you – for an upfront fee. Legitimate law enforcement agencies don’t’ charge for attempting to help telemarketing scam victims.